Gates open at 5:30 pm. Event is held rain or shine. Food will be available beginning at 6 pm. Movies begin at 8 p.m. Please support the Drive-In Concession for their support of Scouting. 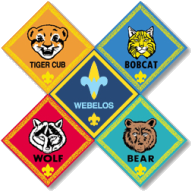 At registration Friday night you will receive directions to your pack's camping site. Families may have to carry in their gear. Cost: $10.00 for adult and $8.00 for scouts and youth. Cost includes event patch, two family movies, and camping overnight at the drive-in. Money will be collected at the door. All scouts registering that night will be admitted to the event for free.